Russia's first military communications satellite. Built by OKB-1 (#1L-7L); NPO Prikladnoi Mekhaniki (NPO PM) (#8L-35L). Launched 1967 - 1975. Used KAUR-2 bus. AKA: 11F67. Status: Operational 1964. First Launch: 1964-06-04. Last Launch: 1975-09-02. Number: 37 . Thrust: 1.96 kN (441 lbf). Gross mass: 1,650 kg (3,630 lb). Specific impulse: 290 s. Height: 4.40 m (14.40 ft). Span: 8.20 m (26.90 ft). In 1968 operational use of Molniya 1 began. It provided strategic control of the RSVN, Long Range Aviation, Navy, through use of the satellite system Molniya 1-Korund and the Ruchey communications system. The externally similar but internally upgraded Molniya 1T replaced the original model in production from 1975. 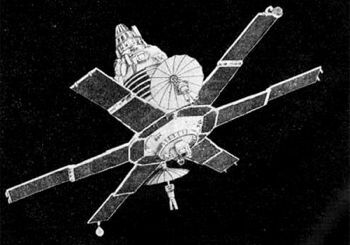 The full constellation in Soviet times consisted of eight spacecraft, in four orbital planes, with ascending node / 'hovering' points above 60 degrees North every 90 degrees from 10 degrees East. RCS total impulse: 78 kgf-sec. Electric System: 1.30 average kW. Family: Communications, Military communications sat, Molniya orbit. Country: Russia. Engines: KDU-414. Launch Vehicles: R-7, Molniya 8K78, Proton, Molniya 8K78M, Proton-K/DM. Propellants: Nitric acid/UDMH. Projects: Molniya. Launch Sites: Baikonur, Baikonur LC1, Plesetsk, Baikonur LC31, Plesetsk LC43/4, Baikonur LC81/24. Agency: MOM, Reshetnev bureau. Bibliography: 102, 2, 21, 274, 367, 376, 3962, 445, 474, 6, 64, 65, 12846, 12847, 12848, 12849, 12850. 1960 October 30 - . Full development of Molniya-1 communications satellite authorised by government decree. - . Nation: Russia. Spacecraft Bus: KAUR-2. Spacecraft: Molniya-1. 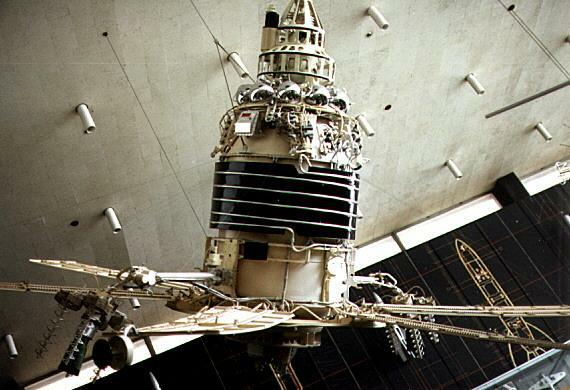 Three such satellites could provide long-distance communications coverage for the entire Soviet Union. Original designed life was 1.5 to 2.0 years. Development was completed in May 1963..
1961 October 30 - . Molniya-1 and Meteor-1 satellites authorised. - . Nation: Russia. Spacecraft: Meteor, Molniya-1, Molniya-2. 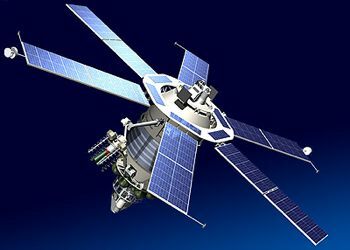 Central Committee of the Communist Party and Council of Soviet Ministers Decree 'On approval of work on the Molniya-1 communications satellite and Meteor-1 weather satellite' was issued. Thedecree authorised work on the Molniya-1M production model, providing international communications on the centimetre band. But the protoype Molniya-1 worked so well that it was taken directly into service, and the -1M was skipped. 1964 June 4 - . Launch Site: Baikonur. Launch Complex: Baikonur LC1. LV Family: R-7. Launch Vehicle: Molniya 8K78. FAILURE: At T+104 sec the tank draining of core Block A failed due to jamming of the servo-motored throttle and break down of the motor's circuit The launcher was destroyed on impact downrange from the pad.. Failed Stage: 0. Molniya-1 s/n 2 Failure - . Payload: Molniya-1 s/n 2. Mass: 1,600 kg (3,500 lb). Nation: Russia. Agency: RVSN. Program: Molniya. Class: Communications. Type: Military communications satellite. Spacecraft Bus: KAUR-2. Spacecraft: Molniya-1. Unsuccessful first attempt to launch Molniya communications satellite..
1964 August 22 - . 07:12 GMT - . Launch Site: Baikonur. Launch Complex: Baikonur LC1. LV Family: R-7. Launch Vehicle: Molniya 8K78. Cosmos 41 - . Payload: Molniya-1. Mass: 1,500 kg (3,300 lb). Nation: Russia. Agency: Korolev bureau. Program: Molniya. Class: Communications. Type: Military communications satellite. Spacecraft Bus: KAUR-2. Spacecraft: Molniya-1. Decay Date: 2004-04-09 . USAF Sat Cat: 869 . COSPAR: 1964-049D. Apogee: 39,169 km (24,338 mi). Perigee: 1,023 km (635 mi). Inclination: 68.40 deg. Period: 714.50 min. Successful launch of first Soviet communications satellite. This is the second Molniya launch attempt. (the first was a launch failure). The failure of the antennae to deploy means the spacecraft can only be tested in a limited manner and cannot be used for the planned relay of television. 1965 April 23 - . 01:55 GMT - . Launch Site: Baikonur. Launch Complex: Baikonur LC1. LV Family: R-7. Launch Vehicle: Molniya 8K78. Molniya 1-01 - . Payload: Molniya-1. Mass: 1,600 kg (3,500 lb). Nation: Russia. Agency: MOM. Program: Molniya. Class: Communications. Type: Military communications satellite. Spacecraft Bus: KAUR-2. Spacecraft: Molniya-1. Decay Date: 1979-08-16 . USAF Sat Cat: 1324 . COSPAR: 1965-030A. Apogee: 39,300 km (24,400 mi). Perigee: 538 km (334 mi). Inclination: 65.50 deg. Period: 707.30 min. First announced launch of Soviet communications satellite. Television programme transmission and long range two way multi channel telephone and telegraph communications. Orbital characteristics after correction of 2 May 1965..
1965 October 14 - . 19:40 GMT - . Launch Site: Baikonur. Launch Complex: Baikonur LC1. LV Family: R-7. Launch Vehicle: Molniya 8K78. Molniya 1-02 - . Payload: Molniya-1. Mass: 1,600 kg (3,500 lb). Nation: Russia. Agency: MOM. Program: Molniya. Class: Communications. Type: Military communications satellite. Spacecraft Bus: KAUR-2. Spacecraft: Molniya-1. Decay Date: 1967-03-17 . USAF Sat Cat: 1621 . COSPAR: 1965-080A. Apogee: 39,921 km (24,805 mi). Perigee: 487 km (302 mi). Inclination: 65.20 deg. Period: 718.80 min. France - USSR communications link. Second communications satellite 'Molniya-1'. Television programme transmission and long-range, two-way multi-channel telephone, phototelegraph and telegraph communications..
1966 March 27 - . Launch Site: Baikonur. Launch Complex: Baikonur LC31. LV Family: R-7. Launch Vehicle: Molniya 8K78. FAILURE: The booster failed during ascent. The launcher and payload broke up on impact with the ground.. Failed Stage: 1. Molniya-1 s/n 5 Failure - . Payload: Molniya-1 s/n 5. Mass: 1,600 kg (3,500 lb). Nation: Russia. Agency: RVSN. Program: Molniya. Class: Communications. Type: Military communications satellite. Spacecraft Bus: KAUR-2. Spacecraft: Molniya-1. 1966 April 25 - . 07:12 GMT - . Launch Site: Baikonur. Launch Complex: Baikonur LC31. LV Family: R-7. Launch Vehicle: Molniya 8K78. Molniya 1-03 - . Payload: Molniya-1. Mass: 1,600 kg (3,500 lb). Nation: Russia. Agency: MOM. Program: Molniya. Class: Communications. Type: Military communications satellite. Spacecraft Bus: KAUR-2. Spacecraft: Molniya-1. Decay Date: 1973-06-11 . USAF Sat Cat: 2151 . COSPAR: 1966-035A. Apogee: 39,414 km (24,490 mi). Perigee: 546 km (339 mi). Inclination: 65.00 deg. Period: 709.80 min. Also transmitted cloud cover images. Television programme transmission and long-range two-way multi-channel telephone, phototelegraph and telegraph communicaitons. .
N1 two-launch moon scenario proposed - . Nation: Russia. Related Persons: Bushuyev, Korolev. Program: Lunar L3, Lunar L1, Soyuz. Spacecraft: LK, Molniya-1, Soyuz 7K-L1, Soyuz 7K-LOK, Soyuz 7K-OK.
1966 October 20 - . 07:55 GMT - . Launch Site: Baikonur. Launch Complex: Baikonur LC1. LV Family: R-7. Launch Vehicle: Molniya 8K78. Molniya 1-04 - . Payload: Molniya-1. Mass: 1,600 kg (3,500 lb). Nation: Russia. Agency: MOM. Program: Molniya. Class: Communications. Type: Military communications satellite. Spacecraft Bus: KAUR-2. Spacecraft: Molniya-1. Decay Date: 1968-09-11 . USAF Sat Cat: 2501 . COSPAR: 1966-092A. Apogee: 39,689 km (24,661 mi). Perigee: 500 km (310 mi). Inclination: 65.30 deg. Period: 714.40 min. Television programme transmission and long-range two-way multi-channel telephone, phototelegraph and telegraph communicaitons..
1967 May 24 - . 22:50 GMT - . Launch Site: Baikonur. Launch Complex: Baikonur LC1. LV Family: R-7. Launch Vehicle: Molniya 8K78. Molniya 1-05 - . Payload: Molniya-1. Mass: 1,600 kg (3,500 lb). Nation: Russia. Agency: MOM. Program: Molniya. Class: Communications. Type: Military communications satellite. Spacecraft Bus: KAUR-2. Spacecraft: Molniya-1. Decay Date: 1971-11-26 . USAF Sat Cat: 2822 . COSPAR: 1967-052A. Apogee: 35,690 km (22,170 mi). Perigee: 90 km (55 mi). Inclination: 64.60 deg. Period: 627.00 min. Further development and experimental operation of long-range two-way television and telephone-telegraph radio-communication..
1967 August 31 - . 08:00 GMT - . Launch Site: Baikonur. Launch Complex: Baikonur LC1. Launch Pad: LC1/LC31?. LV Family: R-7. Launch Vehicle: Molniya 8K78. Cosmos 174 - . Payload: Molniya-1. Mass: 1,600 kg (3,500 lb). Nation: Russia. Agency: MOM. Program: Molniya. Class: Communications. Type: Military communications satellite. Spacecraft Bus: KAUR-2. Spacecraft: Molniya-1. Decay Date: 1968-12-30 . USAF Sat Cat: 2925 . COSPAR: 1967-082A. Apogee: 39,796 km (24,728 mi). Perigee: 430 km (260 mi). Inclination: 64.90 deg. Period: 715.00 min. Probable commsat failure. Investigation of the upper atmosphere and outer space..
1967 October 3 - . 05:00 GMT - . Launch Site: Baikonur. Launch Complex: Baikonur LC1. Launch Pad: LC1 or LC31. LV Family: R-7. Launch Vehicle: Molniya 8K78. Molniya 1-06 - . Payload: Molniya-1. Mass: 1,600 kg (3,500 lb). Nation: Russia. Agency: MOM. Program: Molniya. Class: Communications. Type: Military communications satellite. Spacecraft Bus: KAUR-2. Spacecraft: Molniya-1. Decay Date: 1969-03-04 . USAF Sat Cat: 2973 . COSPAR: 1967-095A. Apogee: 39,709 km (24,673 mi). Perigee: 508 km (315 mi). Inclination: 64.70 deg. Period: 714.90 min. Operation of a system of long range telephone-telegraph radiocommunication, and transmission of USSR Central Television programmes to the stations of the Orbita network..
1967 October 22 - . 08:40 GMT - . Launch Site: Baikonur. Launch Complex: Baikonur LC1. Launch Pad: LC1 or LC31. LV Family: R-7. Launch Vehicle: Molniya 8K78. Molniya 1-07 - . Payload: Molniya-1. Mass: 1,600 kg (3,500 lb). Nation: Russia. Agency: MOM. Program: Molniya. Class: Communications. Type: Military communications satellite. Spacecraft Bus: KAUR-2. Spacecraft: Molniya-1. Decay Date: 1969-12-31 . USAF Sat Cat: 3008 . COSPAR: 1967-101A. Apogee: 39,709 km (24,673 mi). Perigee: 508 km (315 mi). Inclination: 64.80 deg. Period: 714.90 min. Operation of a system of long range telephone-telegraph radiocommunication, and transmission of USSR Central Television programmes to the stations of the Orbita network..
1968 April 21 - . 04:20 GMT - . Launch Site: Baikonur. Launch Complex: Baikonur LC1. Launch Pad: LC1 or LC31. LV Family: R-7. Launch Vehicle: Molniya 8K78M. Molniya 1-08 - . Payload: Molniya-1. Mass: 1,600 kg (3,500 lb). Nation: Russia. Agency: MOM. Program: Molniya. Class: Communications. Type: Military communications satellite. Spacecraft Bus: KAUR-2. Spacecraft: Molniya-1. Decay Date: 1974-01-29 . USAF Sat Cat: 3209 . COSPAR: 1968-035A. Apogee: 40,099 km (24,916 mi). Perigee: 405 km (251 mi). Inclination: 64.00 deg. Period: 720.80 min. Operation of a system of long range telephone-telegraph radiocommunication, and transmission of USSR Central Television programmes to the stations of the Orbita network..
1968 July 5 - . 15:25 GMT - . Launch Site: Baikonur. Launch Complex: Baikonur LC1. Launch Pad: LC1 or LC31. LV Family: R-7. Launch Vehicle: Molniya 8K78M. Molniya 1-09 - . Payload: Molniya-1. Mass: 1,600 kg (3,500 lb). Nation: Russia. Agency: MOM. Program: Molniya. Class: Communications. Type: Military communications satellite. Spacecraft Bus: KAUR-2. Spacecraft: Molniya-1. Decay Date: 1971-05-15 . USAF Sat Cat: 3310 . COSPAR: 1968-057A. Apogee: 39,806 km (24,734 mi). Perigee: 396 km (246 mi). Inclination: 65.10 deg. Period: 714.70 min. Operation of a system of long range telephone-telegraph radiocommunication, and transmission of USSR Central Television programmes to the stations of the Orbita network..
1968 October 5 - . 00:32 GMT - . Launch Site: Baikonur. Launch Complex: Baikonur LC1. Launch Pad: LC1 or LC31. LV Family: R-7. Launch Vehicle: Molniya 8K78M. Molniya 1-10 - . Payload: Molniya-1. Mass: 1,600 kg (3,500 lb). Nation: Russia. Agency: MOM. Program: Molniya. Class: Communications. Type: Military communications satellite. Spacecraft Bus: KAUR-2. Spacecraft: Molniya-1. Decay Date: 1976-07-16 . USAF Sat Cat: 3469 . COSPAR: 1968-085A. Apogee: 39,596 km (24,603 mi). Perigee: 498 km (309 mi). Inclination: 64.90 deg. Period: 712.50 min. Operation of a system of long range telephone-telegraph radiocommunication, and transmission of USSR Central Television programmes to the stations of the Orbita network..
1968 December 16 - . 09:15 GMT - . Launch Site: Baikonur. Launch Complex: Baikonur LC1. Launch Pad: LC1 or LC31. LV Family: R-7. Launch Vehicle: Molniya 8K78M. Cosmos 260 - . Payload: Molniya-1. Mass: 1,600 kg (3,500 lb). Nation: Russia. Agency: MOM. Program: Molniya. Class: Communications. Type: Military communications satellite. Spacecraft Bus: KAUR-2. Spacecraft: Molniya-1. Decay Date: 1973-07-09 . USAF Sat Cat: 3619 . COSPAR: 1968-115A. Apogee: 39,573 km (24,589 mi). Perigee: 506 km (314 mi). Inclination: 65.00 deg. Period: 712.20 min. Investigation of the upper atmosphere and outer space..
1969 April 11 - . 02:30 GMT - . Launch Site: Baikonur. Launch Complex: Baikonur LC1. Launch Pad: LC1 or LC31. LV Family: R-7. Launch Vehicle: Molniya 8K78M. Molniya 1-11 - . Payload: Molniya-1. Mass: 1,600 kg (3,500 lb). Nation: Russia. Agency: MOM. Program: Molniya. Class: Communications. Type: Military communications satellite. Spacecraft Bus: KAUR-2. Spacecraft: Molniya-1. Decay Date: 1974-04-17 . USAF Sat Cat: 3885 . COSPAR: 1969-035A. Apogee: 39,595 km (24,603 mi). Perigee: 483 km (300 mi). Inclination: 64.90 deg. Period: 712.10 min. Operation of a system of long range telephone-telegraph radiocommunication, and transmission of USSR Central Television programmes to the stations of the Orbita network..
1969 July 22 - . 12:55 GMT - . Launch Site: Baikonur. Launch Complex: Baikonur LC1. Launch Pad: LC1 or LC31. LV Family: R-7. Launch Vehicle: Molniya 8K78M. Molniya 1-12 - . Payload: Molniya-1. Mass: 1,600 kg (3,500 lb). Nation: Russia. Agency: MOM. Program: Molniya. Class: Communications. Type: Military communications satellite. Spacecraft Bus: KAUR-2. Spacecraft: Molniya-1. Decay Date: 1971-06-18 . USAF Sat Cat: 4043 . COSPAR: 1969-061A. Apogee: 39,526 km (24,560 mi). Perigee: 496 km (308 mi). Inclination: 64.90 deg. Period: 711.00 min. Operation of a system of long range telephone-telegraph radiocommunication, and transmission of USSR Central Television programmes to the stations of the Orbita network..
1970 February 19 - . 18:57 GMT - . Launch Site: Plesetsk. Launch Complex: Plesetsk LC43/4. LV Family: R-7. Launch Vehicle: Molniya 8K78M. Molniya 1-13 - . Payload: Molniya-1. Mass: 1,600 kg (3,500 lb). Nation: Russia. Agency: MOM. Program: Molniya. Class: Communications. Type: Military communications satellite. Spacecraft Bus: KAUR-2. Spacecraft: Molniya-1. Decay Date: 1975-09-29 . USAF Sat Cat: 4336 . COSPAR: 1970-013A. Apogee: 39,170 km (24,330 mi). Perigee: 461 km (286 mi). Inclination: 65.40 deg. Period: 703.10 min. The first launch of the 8K78M vehicle from the Plesetsk launch site. Operation of a system of long range telephone-telegraph radiocommunication, and transmission of USSR Central Television programmes to the stations of the Orbita network..
1970 June 26 - . 03:23 GMT - . Launch Site: Plesetsk. LV Family: R-7. Launch Vehicle: Molniya 8K78M. Molniya 1-14 - . Payload: Molniya-1. Mass: 1,600 kg (3,500 lb). Nation: Russia. Agency: MOM. Program: Molniya. Class: Communications. Type: Military communications satellite. Spacecraft Bus: KAUR-2. Spacecraft: Molniya-1. Decay Date: 1976-02-16 . USAF Sat Cat: 4430 . COSPAR: 1970-049A. Apogee: 39,172 km (24,340 mi). Perigee: 459 km (285 mi). Inclination: 65.50 deg. Period: 703.10 min. Operation of a system of long range telephone-telegraph radiocommunication, and transmission of USSR Central Television programmes to the stations of the Orbita network..
1970 September 29 - . 08:14 GMT - . Launch Site: Plesetsk. LV Family: R-7. Launch Vehicle: Molniya 8K78M. Molniya 1-15 - . Payload: Molniya-1. Mass: 1,600 kg (3,500 lb). Nation: Russia. Agency: MOM. Program: Molniya. Class: Communications. Type: Military communications satellite. Spacecraft Bus: KAUR-2. Spacecraft: Molniya-1. Decay Date: 1976-03-20 . USAF Sat Cat: 4569 . COSPAR: 1970-077A. Apogee: 39,296 km (24,417 mi). Perigee: 492 km (305 mi). Inclination: 65.20 deg. Period: 706.30 min. Operation of a system of long range telephone-telegraph radiocommunication, and transmission of USSR Central Television programmes to the stations of the Orbita network..
1970 November 27 - . 15:47 GMT - . Launch Site: Plesetsk. LV Family: R-7. Launch Vehicle: Molniya 8K78M. Molniya 1-16 - . Payload: Molniya-1. Mass: 1,600 kg (3,500 lb). Nation: Russia. Agency: MOM. Program: Molniya. Class: Communications. Type: Military communications satellite. Spacecraft Bus: KAUR-2. Spacecraft: Molniya-1. Decay Date: 1975-11-25 . USAF Sat Cat: 4779 . COSPAR: 1970-101A. Apogee: 39,895 km (24,789 mi). Perigee: 463 km (287 mi). Inclination: 65.50 deg. Period: 717.80 min. Operation of a system of long range telephone-telegraph radiocommunication, and transmission of USSR Central Television programmes to the stations of the Orbita network..
1970 December 25 - . 03:50 GMT - . Launch Site: Baikonur. Launch Complex: Baikonur LC1. Launch Pad: LC1 or LC31. LV Family: R-7. Launch Vehicle: Molniya 8K78M. Molniya 1-17 - . Payload: Molniya-1. Mass: 1,600 kg (3,500 lb). Nation: Russia. Agency: MOM. Program: Molniya. Class: Communications. Type: Military communications satellite. Spacecraft Bus: KAUR-2. Spacecraft: Molniya-1. Decay Date: 1975-12-22 . USAF Sat Cat: 4829 . COSPAR: 1970-114A. Apogee: 39,881 km (24,780 mi). Perigee: 474 km (294 mi). Inclination: 65.00 deg. Period: 717.80 min. Operation of a system of long range telephone-telegraph radiocommunication, and transmission of USSR Central Television programmes to the stations of the Orbita network..
1971 July 28 - . 03:29 GMT - . Launch Site: Plesetsk. LV Family: R-7. Launch Vehicle: Molniya 8K78M. Molniya 1-18 - . Payload: Molniya-1. Mass: 1,600 kg (3,500 lb). Nation: Russia. Agency: MOM. Program: Molniya. Class: Communications. Type: Military communications satellite. Spacecraft Bus: KAUR-2. Spacecraft: Molniya-1. Decay Date: 1977-07-19 . USAF Sat Cat: 5367 . COSPAR: 1971-064A. Apogee: 39,877 km (24,778 mi). Perigee: 478 km (297 mi). Inclination: 65.40 deg. Period: 717.80 min. Operation of a system of long range telephone-telegraph radiocommunication, and transmission of USSR Central Television programmes to the stations of the Orbita network..
1971 December 19 - . 22:50 GMT - . Launch Site: Plesetsk. LV Family: R-7. Launch Vehicle: Molniya 8K78M. Molniya 1-19 - . Payload: Molniya-1. Mass: 1,600 kg (3,500 lb). Nation: Russia. Agency: MOM. Program: Molniya. Class: Communications. Type: Military communications satellite. Spacecraft Bus: KAUR-2. Spacecraft: Molniya-1. Decay Date: 1977-04-13 . USAF Sat Cat: 5712 . COSPAR: 1971-115A. 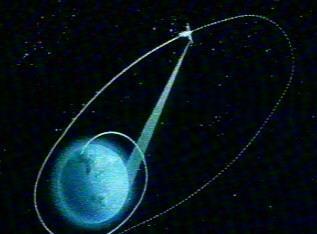 Apogee: 39,126 km (24,311 mi). Perigee: 522 km (324 mi). Inclination: 65.00 deg. Period: 703.50 min. Operation of a system of long range telephone-telegraph radiocommunication, and transmission of USSR Central Television programmes to the stations of the Orbita network..
1972 April 4 - . 20:38 GMT - . Launch Site: Plesetsk. Launch Complex: Plesetsk LC43/4. LV Family: R-7. Launch Vehicle: Molniya 8K78M. Molniya 1-20 - . Payload: Molniya-1 s/n 27. Mass: 1,600 kg (3,500 lb). Nation: Russia. Agency: MOM. Program: Molniya. Class: Communications. Type: Military communications satellite. Spacecraft Bus: KAUR-2. Spacecraft: Molniya-1. Decay Date: 1974-01-30 . USAF Sat Cat: 5927 . COSPAR: 1972-025A. Apogee: 40,006 km (24,858 mi). Perigee: 343 km (213 mi). Inclination: 65.70 deg. Period: 717.60 min. Operation of the long-range telephone and telegraph radiocommunications system in the USSR; transmission of television programmes to stations in the Orbita network..
1972 October 14 - . 06:16 GMT - . Launch Site: Plesetsk. LV Family: R-7. Launch Vehicle: Molniya 8K78M. Molniya 1-21 - . Payload: Molniya-1. Mass: 1,600 kg (3,500 lb). Nation: Russia. Agency: MOM. Program: Molniya. Class: Communications. Type: Military communications satellite. Spacecraft Bus: KAUR-2. Spacecraft: Molniya-1. Decay Date: 1977-11-01 . USAF Sat Cat: 6231 . COSPAR: 1972-081A. Apogee: 34,684 km (21,551 mi). Perigee: 494 km (306 mi). Inclination: 65.40 deg. Period: 615.40 min. Uncertain if Molniya-1T model was Molniya-1 or Molniya-1T. Operation of the long-range telephone and telegraph radiocommunications system in the USSR; transmission of television programmes to stations in the Orbita network..
1972 December 2 - . 04:39 GMT - . Launch Site: Baikonur. Launch Complex: Baikonur LC1. Launch Pad: LC1 or LC31. LV Family: R-7. Launch Vehicle: Molniya 8K78M. Molniya 1-22 - . Payload: Molniya-1. Mass: 1,600 kg (3,500 lb). Nation: Russia. Agency: MOM. Program: Molniya. Class: Communications. Type: Military communications satellite. Spacecraft Bus: KAUR-2. Spacecraft: Molniya-1. Decay Date: 1976-02-11 . USAF Sat Cat: 6294 . COSPAR: 1972-095A. Apogee: 39,608 km (24,611 mi). Perigee: 462 km (287 mi). Inclination: 64.00 deg. Period: 712.00 min. Uncertain if Molniya-1T model was Molniya-1 or Molniya-1T. Operation of a system of long range telephone-telegraph radiocommunication, and transmission of USSR Central Television programmes to the stations of the Orbita network..
1973 February 3 - . 05:48 GMT - . Launch Site: Baikonur. Launch Complex: Baikonur LC1. Launch Pad: LC1 or LC31. LV Family: R-7. Launch Vehicle: Molniya 8K78M. Molniya 1-23 - . Payload: Molniya-1. Mass: 1,600 kg (3,500 lb). Nation: Russia. Agency: MOM. Program: Molniya. Class: Communications. Type: Military communications satellite. Spacecraft Bus: KAUR-2. Spacecraft: Molniya-1. Decay Date: 1977-10-23 . USAF Sat Cat: 6356 . COSPAR: 1973-007A. Apogee: 39,602 km (24,607 mi). Perigee: 476 km (295 mi). Inclination: 65.00 deg. Period: 712.20 min. Uncertain if Molniya-1T model was Molniya-1 or Molniya-1T. Operation of a system of long range telephone-telegraph radiocommunication, and transmission of USSR Central Television programmes to the stations of the Orbita network..
1973 August 30 - . 00:07 GMT - . Launch Site: Plesetsk. LV Family: R-7. Launch Vehicle: Molniya 8K78M. Molniya 1-24 - . Payload: Molniya-1. Mass: 1,600 kg (3,500 lb). Nation: Russia. Agency: MOM. Program: Molniya. Class: Communications. Type: Military communications satellite. Spacecraft Bus: KAUR-2. Spacecraft: Molniya-1. Decay Date: 1979-12-05 . USAF Sat Cat: 6805 . COSPAR: 1973-061A. Apogee: 39,893 km (24,788 mi). Perigee: 463 km (287 mi). Inclination: 65.50 deg. Period: 717.80 min. Uncertain if Molniya-1T model was Molniya-1 or Molniya-1T. Operation of a system of long range telephone-telegraph radiocommunication, and transmission of USSR Central Television programmes to the stations of the Orbita network..
1973 November 14 - . 20:40 GMT - . Launch Site: Baikonur. Launch Complex: Baikonur LC1. Launch Pad: LC1 or LC31. LV Family: R-7. Launch Vehicle: Molniya 8K78M. Molniya 1-25 - . Payload: Molniya-1. Mass: 1,600 kg (3,500 lb). Nation: Russia. Agency: MOM. Program: Molniya. Class: Communications. Type: Military communications satellite. Spacecraft Bus: KAUR-2. Spacecraft: Molniya-1. Decay Date: 1979-05-26 . USAF Sat Cat: 6932 . COSPAR: 1973-089A. Apogee: 39,607 km (24,610 mi). Perigee: 461 km (286 mi). Inclination: 64.00 deg. Period: 712.00 min. Operation of a system of long range telephone-telegraph radiocommunication, and transmission of USSR Central Television programmes to the stations of the Orbita network. .
1973 November 30 - . 13:08 GMT - . Launch Site: Plesetsk. LV Family: R-7. Launch Vehicle: Molniya 8K78M. Molniya 1-26 - . Payload: Molniya-1. Mass: 1,600 kg (3,500 lb). Nation: Russia. Agency: MOM. Program: Molniya. Class: Communications. Type: Military communications satellite. Spacecraft Bus: KAUR-2. Spacecraft: Molniya-1. Decay Date: 1985-06-09 . USAF Sat Cat: 6958 . COSPAR: 1973-097A. Apogee: 40,829 km (25,369 mi). Perigee: 619 km (384 mi). Inclination: 62.90 deg. Period: 740.00 min. Uncertain if Molniya-1T model was Molniya-1 or Molniya-1T. Operation of a system of long range telephone-telegraph radiocommunication, and transmission of USSR Central Television programmes to the stations of the Orbita network..
1974 April 20 - . 20:53 GMT - . Launch Site: Plesetsk. LV Family: R-7. Launch Vehicle: Molniya 8K78M. Molniya 1-27 - . Payload: Molniya-1. Mass: 1,600 kg (3,500 lb). Nation: Russia. Agency: MOM. Program: Molniya. Class: Communications. Type: Military communications satellite. Spacecraft Bus: KAUR-2. Spacecraft: Molniya-1. Decay Date: 1983-11-17 . USAF Sat Cat: 7260 . COSPAR: 1974-023A. Apogee: 39,752 km (24,700 mi). Perigee: 606 km (376 mi). Inclination: 63.00 deg. Period: 717.80 min. Uncertain if Molniya-1T model was Molniya-1 or Molniya-1T. Operation of a system of long range telephone-telegraph radiocommunication, and transmission of USSR Central Television programmes to the stations of the Orbita network..
1974 July 29 - . 12:00 GMT - . Launch Site: Baikonur. Launch Complex: Baikonur LC81/24. LV Family: Proton. Launch Vehicle: Proton-K/DM. Molniya 1-S - . Payload: Molniya 1 s/n 38. Mass: 800 kg (1,760 lb). Nation: Russia. Agency: MOM. Program: Molniya. Class: Communications. Type: Military communications satellite. Spacecraft Bus: KAUR-2. Spacecraft: Molniya-1. Completed Operations Date: 1974-07-01 . USAF Sat Cat: 7392 . COSPAR: 1974-060A. Apogee: 35,848 km (22,274 mi). Perigee: 35,738 km (22,206 mi). Inclination: 14.80 deg. Period: 1,436.40 min. Evidently a unique experimental satellite. Arrangements for experimental television broadcasts and establishment of long-range radio-communications. As of 29 August 2001 located at 104.72 deg E drifting at 0.115 deg W per day. As of 2007 Mar 10 located at 41.05E drifting at 0.029W degrees per day. 1974 October 24 - . 12:39 GMT - . Launch Site: Plesetsk. LV Family: R-7. Launch Vehicle: Molniya 8K78M. Molniya 1-28 - . Payload: Molniya-1 s/n 26. Mass: 1,600 kg (3,500 lb). Nation: Russia. Agency: MOM. Program: Molniya. Class: Communications. Type: Military communications satellite. Spacecraft Bus: KAUR-2. Spacecraft: Molniya-1. Decay Date: 1985-12-29 . USAF Sat Cat: 7480 . COSPAR: 1974-081A. Apogee: 40,633 km (25,248 mi). Perigee: 607 km (377 mi). Inclination: 62.80 deg. Period: 735.80 min. Decay date suspect Uncertain if Molniya-1T model was Molniya-1 or Molniya-1T. Operation of a system of long range telephone-telegraph radiocommunication, and transmission of USSR Central Television programmes to the stations of the Orbita network..
1975 April 29 - . 10:24 GMT - . Launch Site: Plesetsk. LV Family: R-7. Launch Vehicle: Molniya 8K78M. Molniya 1-29 - . Payload: Molniya-1. Mass: 1,600 kg (3,500 lb). Nation: Russia. Agency: MOM. Program: Molniya. Class: Communications. Type: Military communications satellite. Spacecraft Bus: KAUR-2. Spacecraft: Molniya-1. USAF Sat Cat: 7780 . COSPAR: 1975-036A. Apogee: 38,379 km (23,847 mi). Perigee: 1,983 km (1,232 mi). Inclination: 63.80 deg. Period: 717.90 min. Uncertain if Molniya-1T model was Molniya-1 or Molniya-1T. Operation of the long-range telephone and telegraph radiocommunications system in the USSR; transmission of television programmes to stations in the Orbita network..
1975 June 5 - . 01:38 GMT - . Launch Site: Plesetsk. LV Family: R-7. Launch Vehicle: Molniya 8K78M. Molniya 1-30 - . Payload: Molniya-1 s/n 24. Mass: 1,600 kg (3,500 lb). Nation: Russia. Agency: MOM. Program: Molniya. Class: Communications. Type: Military communications satellite. Spacecraft Bus: KAUR-2. Spacecraft: Molniya-1. Decay Date: 1987-08-12 . USAF Sat Cat: 7903 . COSPAR: 1975-049A. Apogee: 38,307 km (23,802 mi). Perigee: 121 km (75 mi). Inclination: 63.40 deg. Period: 679.10 min. Uncertain if Molniya-1T model was Molniya-1 or Molniya-1T. Operation of the long-range telephone and telegraph radiocommunications system in the USSR; transmission of television programmes to stations in the Orbita network..
1975 September 2 - . 13:09 GMT - . Launch Site: Plesetsk. LV Family: R-7. Launch Vehicle: Molniya 8K78M. Molniya 1-31 - . Payload: Molniya-1. Mass: 1,600 kg (3,500 lb). Nation: Russia. Agency: MOM. Program: Molniya. Class: Communications. Type: Military communications satellite. Spacecraft Bus: KAUR-2. Spacecraft: Molniya-1. Decay Date: 1985-11-19 . USAF Sat Cat: 8187 . COSPAR: 1975-079A. Apogee: 40,598 km (25,226 mi). Perigee: 633 km (393 mi). Inclination: 62.90 deg. Period: 735.60 min. Uncertain if Molniya-1T model was Molniya-1 or Molniya-1T. Operation of the long-range telephone and telegraph radiocommunications system in the USSR; transmission of television programmes to stations in the Orbita network..